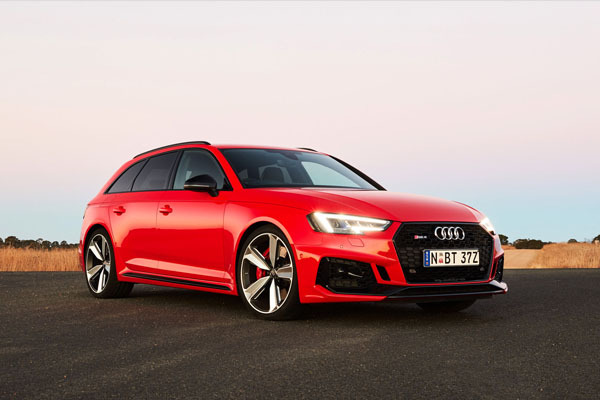 Audi has released the latest version of its RS4 Avant, a high-performance sporty Euro wagon with a heritage that goes back almost 25 years to the Audi RS2 Avant of 1994. The biggest change in this fourth generation RS4 Avant lies under the bonnet where the previous 4.2-litre naturally-aspirated V8 engine has been replaced by a biturbo 2.9-litre V6. The turbocharged engine matches the V8’s 331 kW of power but picks up an extra 170 Nm of torque to reach a neck-snapping 600 Nm from just 1900 rpm, compared with the 4000 revs that the V8 needed to peak to 430 Nm. 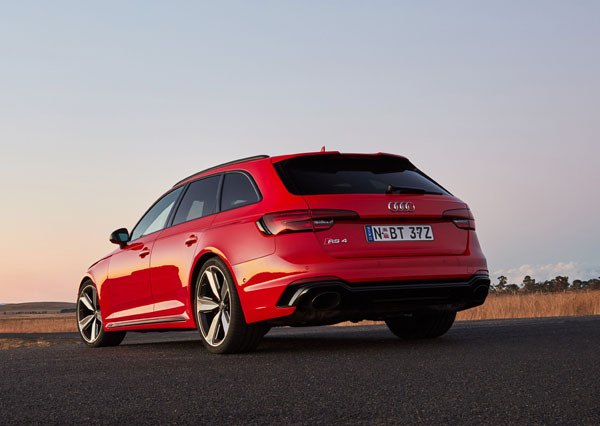 This, together with an overall weight reduction of 80 kg, mainly through Audi’s new MLBevo chassis architecture, makes it the fastest-ever RS4 Avant with its zero-to-100 km/h time of 4.1 seconds around 0.6 seconds better than the V8. At the same time listed fuel consumption drops significantly from 10.7 litres per 100 kilometres to 8.9 litres per hundred. CO2 emissions are also down, from 249 to 202 grams per kilometre. Transmission is through an eight-speed ZF torque-converter automatic with an optimised shift program that delivers power to the quattro permanent all-wheel drive system. Three different drive settings are offered: Individual, Dynamic and Comfortable set through the standard Audi drive select system. The RS sport suspension with Dynamic Ride Control has the car sitting much lower than the A4 production model. Audi also offers optional ceramic brakes and dynamic steering with RS-specific tuning. The new RS4 Avant is marginally longer (by 62 mm) and wider (by 16 mm) than the previous RS4 Avant but also lower to give it a squatter appearance which is further pronounced by new blisters above the wheel guards and the very recognisable Audi single-frame grille which is wider and flatter than before featuring the honeycomb structure typical of RS models. There’s a fairly conservative body kit with RS-specific diffuser insert, oval tailpipes and a surface-mounted spoiler lip. Inside there are Nappa leather sports seats with honeycomb stitching and a flat-bottomed steering wheel, both with RS logos which also feature on the door sill trims and gear selector lever. A sunroof comes standard although it does have a delete option for those who don’t want to sacrifice headroom. There are three optional designs to the 20-inch alloy wheels: gloss black, carbon or matt aluminium. Just about every piece of advanced safety equipment is standard in the new RS4 Avant. There is autonomous emergency braking adaptive; blind spot warning; cruise control with traffic jam assist; lane departure warning; exit warning system to alert those opening either front or rear traffic side doors to a possible impact; rear cross traffic assist; attention assist that monitors possible driver lapse; park assist for parallel or perpendicular spaces; and high beam assist. There are also three pre-sense warning systems to avoid or reduce potential collisions. Audi’s Pre-Sense Basic uses a number of safety systems including electronic stability control to identify possible loss of control and then pretensions seatbelts, closes all windows and sunroof and activates the hazard lights. Pre-Sense Front combines the autonomous emergency braking and pedestrian detection systems at speeds up to 85 km/h, as well as turn assist, collision avoidance assist and high-beam assist. Pre-Sense Rear uses rear mounted sensors to detect an impending rear-end collision and closes all windows, pre-tensions seatbelts as well as activating high visibility hazard lights to increase the likelihood of alerting the driver of the approaching vehicle. Surprisingly to those of who are fans of head-up displays it’s only available as part of a $3900 Technik package which also includes Audi Matrix LED headlights and daytime running lights, and wireless mobile phone charging. 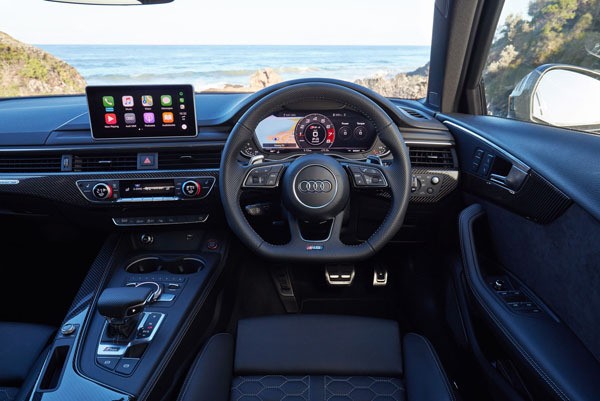 The Audi RS4 comes with standard infotainment features such as the Audi virtual cockpit, Audi connect, smartphone interface and DAB+ digital radio, as well as a high-end Bang & Olufsen 3-D sound system. Audi’s launch drive program for the new RS4 Avant took us from Port Macquarie on a 240 km route to Armidale. There was only a minimal amount of urban and motorway driving an aspect of the car that we can save for our extended test in a month or so. It’s important that we do because Audi does market the Avant as a car for all reasons, including routine daily commuting and family holiday trips. The big test came in the 50 km middle segment of the route where we traversed the Great Dividing Range with a long series of winding ascents and descents. Even at speed and in Comfort mode the car maintained a vice-like grip on the road through even the tightest of corners with only the occasional truck or grey nomad spoiling our fun. Once out onto the open terrain the all-but-instant high torque saw such spoilsports put in our wake. During the test run, the drive select worked best in Comfort mode, Dynamic producing the much stiffer driving experience that’s probably best left for track days. We’ll get the chance to play with the Individual mode during our local testing. New Audi RS4 Avant is on sale now at $152,900 plus on-road costs.